My local Target finally put out its double-wide gravity feeder of 2009 Topps. Strangely, not unlike others out there, it appears retail outlets received their allocations of 09 Topps prior to hobby outlets. I know my hobby source hasn’t received theirs yet — which is irritating as I want more than just retail packs! I bought five packs, and ended up with 49 base cards, five ToppsTown cards, one gold parallel, one Turkey Red insert, one Legends of the Game insert, and one Legends of the Game parallel, for a total of 58 cards. No, I wasn’t shorted — apparently the Students Work Hard cards and Topps Attax code cards count towards your total of 12. That’s 370 potential base cards per hobby box. That should, provided there’s good collation, yield an entire set. Looks like Topps was listening to collectors like myself after all. While the collation looks like it won’t drive me mad, the parallels once again probably will. After glancing at the sell sheets, I knew that the Legends of the Game subset would be one I’d chase. But as you can see, that subset of course, has parallels. It does appear however, that the parallels are limited to the retail version — this makes sense, as these packs came from Target. Nonetheless, the these stupid parallels even exist is room enough for frustration. I’ve been very impressed with the inserts from Topps, and this year is no exception. I figured it’d be hard to top last years Trading Card History and 50th Anniversary All-Rookie Team. The aforementioned Legends of the Game as well as Turkey Red look promising too. And with more cards per box, insert collecting doesn’t take away from base set collecting. The first two Dodgers of the year are Chad Billingsley and Joe Torre. Last year, Andy LaRoche was the first Dodger to appear, and incidentally, Chad Billingsley was the last. Bills gets to lead off in 2009. And of course, Torre’s Dodger “RC” of course didn’t come out until Series 2 last year. Overall, I’m pretty thrilled with the design. The last three years of Topps have had their issues. 2006 was just not easy on the eyes — hated the font and the colors. 2007 looked great, but the black borders made them susceptible to dinged corners. 2008 returned to the white borders, but the quasi-retro design was lacking. 2009’s design is easily my favorite since 2005. So it turns out Manny/Boras, Inc. turned down the latest Dodger contract offer of one year/$25 million. An increased offer, which considering there have been no public counteroffers from any other team, is very generous. Scott Boras is clearly grasping at straws trying to create a non-existent market for Manny. There’s the constant talk of the Giants being interested, but considering their payroll has inflated considerably with their free-agent additions, and their (like the Dodgers) insistence on nothing more than a short-term deal, it’s clear that the Giants aren’t really kicking the tires, so to speak. If anything, this is a lot like the 2006 postseason when Juan Pierre’s agent successfully used the Giants as leverage to increase the Dodgers’ offer to Pierre. Fortunately, it appears Ned’s learned his lesson about that nonsense and isn’t budging from his stance. At least, not to the extent that he did with Pierre. Spring training begins in less than two weeks. Manny, clearly one of the best hitters of this generation, remains unsigned. All of the big money players have either folded (Mets, Orioles), or flat-out didn’t even ante up (Yankees, Angels). And now Boras says he won’t grant the Dodgers the “opportunity” to match any competitive offers? There haven’t been ANY competitive offers, Scott. Clearly this is a game of chicken with the intent of getting the Dodgers to ill-advisedly increase their own offer. And they shouldn’t — why bid against yourself? There’s no doubt the fallout if Manny fails to return to LA will be spectacular. If it indeed Plans B, C, or D come to fruition, I’d hate to be Adam Dunn/Bobby Abreu/Juan Pierre (heaven forbid) trotting out to left field this year. I’d hate to be Ned, or Frank McCourt. But in the end, the Dodgers are playing this correctly. Boras is feverishly trying to create a market that simply doesn’t exist. Worse yet, he, just like everybody else, knows LA is the best place for Manny. But unfortunately, we know that Boras operates under only one motive — his checkbook. If he were truly after his client’s best interest, Manny would’ve re-upped with the Dodgers ages ago. I had an unexpected day off today, so I thought I’d kill some time at the local card source. I was hoping to find some deals — specifically, I was hoping that 07 Topps 52 packs would’ve been marked down by now. Unfortunately, nothing of the sort was there. There were a few random markdowns — 07 Ultra, 07 Topps Update, 08 Topps fat packs — but nothing that really caught my eye. For a second, I even conidered something high-end, as there were mini-boxes of 07 Bowman Sterling for $20. I fought the wax-ripping urge, and boy, was it strong. I even pondered buying Garbage Pail Kids, or even Obama cards. But I fought it off; and it’s probably one of the few times I went in there without spending a penny. All this to say I cannot wait for the 2009 product to come out. I’m eagerly awaiting putting together the Topps set, and I have enough spare change I may even contemplate putting together the Upper Deck set. This is a strange time of year. It seems like only yesterday when Evan Longoria and Carlos Pena were wishing for a miracle; when Manny was picking curveballs from his shoetops and launching them into the Wrigley Field bleachers. Knowing that pitchers and catchers report in a little more than two weeks is making me salivate at the thought of baseball. And the little tidbits — the MLB network, 2009 baseball cards — oh how they tantalize the senses. I’m sure most have read this, but I feel it’s poignant…. p.s. Manny needs to sign with the Dodgers already. Scott Boras’ game of chicken is getting tiresome. So was this an NL West pack or what? Manny, 07 ROY Tulo, and the two D-Backs aces. Interestingly enough, Tulo and Haren are pictured at Dodger Stadium. Oh yeah, there’s also two of the three star 3B from the AL East. I know there’s a lot of grumbling about UD’s change from the 07 configuration of Sweet Spot. Of course, the 08 configuration costs roughly half of what the 07 did. I paid $18 for this box, and currently, DACW is selling 07 tins for $46. Then there’s the 08 retail configuration of three packs of eight cards + one GU per tin, for $30. All I know is I’m glad I didn’t pay any more than I did. The SS signatures are without a doubt some of the coolest looking cards out there. Still, it’s hard to pay this much for a product and not be guaranteed against pulling a lemon (i.e. rookie signatures). And for me, it’s a shame this is Beltre in a Mariners uniform. This card would’ve been the pull of a lifetime five years ago! I can appreciate another Manny in Dodger uniform card, though. Anyway, kudos to UD for bringing this down to a more reasonable price point. Of course, the tradeoff is knowing you could very well end up with a cheap, useless rookie signature. As for the base cards, don’t they remind you an awful lot of this? That’s 1999 UD Ovation, in case you’ve forgotten. But it’s not as though anyone’s buying these mini-boxes in search of base cards. It’s a huge trade-off you’ll have to consider making. Pay less MSRP, but it’s also less likely you’ll end up with the SS autos/more likely you’ll end up with base cards you don’t want. A day late, but the sentiment is the same. Congratulations Mr. Henderson on making it into the Hall of Fame. As you know, Rickey ended his MLB career in 2003 with the Dodgers. Admittedly, when then-GM Dan Evans picked him up, I was quite disappointed. The Dodgers were tied for 1st in the NL West as recently as June 22nd, but were fading fast. By July 14th, they were in 3rd, 7.5 games out. The Dodgers needed some offensive punch, not to mention a leadoff hitter who could get on base. The trio of Dave Roberts, Alex Cora, and Cesar Izturis just wasn’t cutting it. So, as awesome a career as Rickey had, he certainly wasn’t what I figured the Dodgers would get to. Nor was the trade for Jeromy Burnitz two weeks later. In the end, it didn’t matter, as Rickey rode off into the sunset, and the Dodgers finished 15.5 games out of first place. I thought about it last night, but in all the games I saw in person in 2003, I don’t believe Rickey ever was in the lineup. Could very well have been, but that summer was rather momentuous for me, and I didn’t get to many more games after mid-season or so. Which led me to think — how many future HOFers have I seen play in person? Greg Maddux, Randy Johnson, Gary Sheffield, and Barry Bonds (well, should be a future HOFer) come to mind. But I don’t think I ever saw Trevor Hoffman close one out for the Padres (on that note, I never once saw Eric Gagne close out a game in person), nor did I ever see Tom Glavine, Pedro Martinez, Mark McGwire, Alex Rodriguez, Albert Pujols, or Manny Ramirez for that matter. Fortunately, I still have plenty of time to see the last three in action — with the third preferably still wearing Dodger blue. I rarely get to see MLB games in person now, but I do plan on being more mindful when it’s future HOFers we’re talking about. And he bought himself his own airplane. Keeping Andruw Jones and Juan Pierre on the bench forever is good enough reason for me to sign Manny Ramirez like, yesterday. You know who are the real losers? Toronto and Milwaukee. What should’ve been first-round draft pick compensation for losing type-A free agents now gets bumped down to lower rounds, since Los Angeles of Anaheim of Orange County of Southern California of the West Coast of the United States of North America gets the Yankees’ first-round pick (#26). As an aside, it’s too bad the Yankees have another first-round pick, #28a, which they received as compensation for failing to sign 2008 first-rounder Gerrit Cole. Cole of course told the Yankees to take their money elsewhere and opted instead for some time at UCLA. Who else loses? Both the Braves and Angels gave up considerable minor-league talent to acquire Tex, all for naught. $23 million a year for Tex? Wow. You have to hand it to his agent, Scott Boras. In a recession year, the Yankees have now committed to pay $420 million in salary over the next eight years. But don’t ask them to pay for their own ballpark! That’s what the taxpayers of NYC are for! Strangely enough, it’s interesting to see the Yankees actually add a free agent at a position that’s a weakness for them, instead of just going out and signing everybody. And I’m really surprised they preferred the oft-injured A.J. Burnett to the workhorse Derek Lowe. 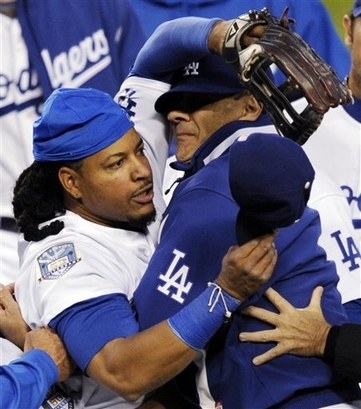 I’d be really irritated if they somehow managed to sign Manny Ramirez as well. I mean, how many 1B/DH/LF types are they expecting to hold on to? The good news? With the Angels publicly declaring they don’t want Manny, and the Red Sox obviously being a non-competitor, that really leaves just the Mets and Nationals as the only potential competition to sign Manny. Right now, Ned Colletti’s choice to only offer a two-year/3rd-year option deal looks like genius. With no one else involved in the bidding, why capitulate to Scott Boras’ demands? While I doubt the deal Manny signs will pay him $22 million a year, Ned’s patience so far has worked in the Dodgers’ favor. Now we’ll get to see if he can close it out, and sign Ramirez to a reasonable contract. I empathize with Braves GM Frank Wren, but ultimately, I feel he’s being childish. I don’t for a second believe that the Braves are going to follow through and ignore every single Wasserman client (which includes current Brave Peter Moylan, among others) from here on out. It’s just bravado; saving face in the wake of being publicly humiliated by Rafael Furcal and his agents. It’s the same sort of bravado Dodger GM Ned Colletti displayed when J.D. Drew and Scott Boras caught Colletti with his pants down. He too claimed he would “never deal with” Boras again. Yet, there’s a contract offer floating around from the Dodgers to Boras client Manny Ramirez. Again, I won’t deny their anger, but really, business is business. Until Furcal’s signature appeared on the bottom of a contract, nothing was, well, nothing. It may be in bad faith, it may even be unethical, but it certainly wasn’t illegal for (Furcal agent) Paul Kinzer to ask for a term sheet (apparently recognized as the step immediately prior to finalization of a deal) and then use it as leverage to get a better deal from the Dodgers. In fact, for once, it shows due diligence on the part of Dodger GM Ned Colletti. The agent claims theres “another offer?” Well, let’s SEE that other offer! I remember the fiasco that was Kevin Brown’s signing — with Scott Boras ultimately getting the Dodgers to bid against themselves, since the “other offers” Boras spoke about were non-existent. In fact, what’s going on the Mark Teixiera fun-for-all is probably the exact same thing — Boras is probably trying to get the Angels, Nationals, et. al., to all bid against themselves — prompting a flat-out denial on the part of Red Sox owner John Henry. We often forget that sports, for as much as our hearts are in invested in it, is and always will be a business first. The athletes, the clubs, everyone is in it to get theirs. So when Rafael Furcal is doing his best to get his, really, we can’t be surprised. When Elton Brand did his best to get his, I wasn’t surprised — although I do take a little bit of snide satisfaction that his defection to a “title contender” hasn’t exactly panned out. Blame the agents if you must, blame the players, but don’t blame the game. Mainly because the game is always and always will be business, never personal.